GMA News reports, “Hong Kong media mogul Sir Run Run Shaw, who created an empire in Asia spanning movies to television, died on Tuesday at the age of 106, his company said. Shaw died peacefully at his home in Hong Kong, surrounded by his family, his company, Television Broadcasts Limited (TVB), said in a statement. One of Hong Kong cinema’s defining figures, Shaw popularized Chinese kung fu films in the West and helped turn the former British colony into a “Hollywood East” over an 80-year career. He set up Hong Kong’s biggest free-to-air television operator, TVB, in 1967 and served as its executive chairman until 2011, helping to shape the city’s media culture. “Thanks to his wise leadership, TVB has its status today after 46 years,” said TVB Executive Chairman Norman Leung. He started out helping his elder brothers Runje, Runde and Runme set up a film studio in Shanghai in 1925. The brothers later moved into Hong Kong – making and distributing films to a chain of around 100 cinemas spread across other Asian markets such as Singapore, Malaysia and Thailand. Shaw eventually split from his brothers to set up his own studio in the 1950s dubbed the dream factory, which ushered in a golden era of Hong Kong film-making. Shaw is also remembered as a philanthropist, especially fondly in mainland China, where he donated 4.5 billion yuan ($744 million) over the years, mostly to education, according to Hong Kong media reports. Many school buildings in the mainland are named after him. Chinese Internet users paid tribute to Shaw on Tuesday, saying wealthy Chinese should follow his example. The Shaw studio produced about a thousand titles, including melodramas, historical epics and kung fu classics like “The One-armed Swordsman” – helping to redefine genres and lure new cinema-goers not only in Hong Kong and Asia, but in the West. Shaw also invested in a number of co-productions, most notably the Ridley Scott classic, “Blade Runner”, starring Harrison Ford, in 1982. The studio also pioneered so-called “Wu Xia” or sword-play genre films – which had frenetic fight scenes with mixed weapons. Ang Lee’s Oscar-winning “Crouching Tiger, Hidden Dragon” is a striking modern example of the genre. The Shaw influence is also evident in the films of kung fu legend Bruce Lee, Jackie Chan and director John Woo. While Shaw was famed for his business acumen and nose for spotting and grooming new talent, he famously turned away a brash, young actor who came to see him in the 1960s. That spurned man was Bruce Lee, who later teamed up with Raymond Chow, a former Shaw deputy-turned-rival, to make “The Big Boss” in 1971, propelling him to stardom. In 1980, Shaw focused on television, becoming the chairman of TVB, which grew into a successful television and entertainment empire that remains a deep influence on popular culture in Hong Kong and overseas Chinese communities. 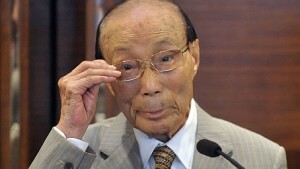 In 2011, Shaw sold his entire 26 percent stake in TVB to a consortium for HK$6.26 billion ($807 million). He retired as chairman at the end of that year after holding the post for 30 years and was appointed chairman emeritus. The tycoon also ran the so-called Shaw prizes, sometimes referred to as Asia’s answer to the Nobel prizes, which rewards excellence in maths, astronomy and science, with a monetary prize of $1 million for each laureate. He was knighted by Britain’s Queen Elizabeth in 1977 and received the Grand Bauhinia Medal from the Hong Kong government in 1998. Popularly known as “Luk Suk” or “Sixth Uncle,” Shaw was born in 1907, the sixth child of a well-to-do family in the eastern Chinese city of Ningbo.